A year before the launch of their second game, the founders of the small independent game developer Introversion ran out of money. Their first title, the hacker simulation Uplink, had surprised them by selling quite a lot, mostly on the strength of rave reviews and thunderous word-of-mouth across internet forums. The success convinced Introversion's team of self-styled "bedroom coders" to approach their game-making as a career rather than a part-time hobby. But after spending two years working on Uplink's follow-up without knowing when a final product would actually be delivered, a member of the team says he started to question the whole project. "At that time, there were a lot of sort of personal choices involved in Introversion," says Chris Delay, the British developer's Creative Director, "because in order to survive we all had to start taking out bank loans and stuff, borrowing money from parents and things. And it was a feeling that to get through, each person kind of had to decide for themselves whether they really wanted to do that. ... That was definitely a time when I thought that it was a lot harder than it should have been. I was kind of thinking, 'What exactly are we doing here, spending three years developing a game without any money?'" 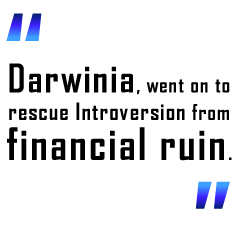 Sales of the game, Darwinia, went on to rescue Introversion from financial ruin, largely thanks to its release through Valve's popular download service, Steam. But the graveyard of the videogame industry is littered with the corpses of starry-eyed developers who weren't as lucky. Impressing critics, building up a loyal cult following and staying true to your artistic vision are sadly often the signs of a failed company in an industry where licensed properties and repetitive sequels still dominate. So, why do people continue to make these cult games if they know there are greener pastures out there? "I really don't want to be a snob about it, but I don't really care if my game's popular with a lot of people," says Tarn Adams, half of the American team behind the fantasy-world simulator Dwarf Fortress. The ambitious project uses circa-1981 graphics to let players shape the lives of a colony of dwarves. Critics have fawned over the game's detailed AI that makes each dwarf behave with a startlingly deep sense of individuality and personality. Adams knows Dwarf Fortress' old-school graphics and text-based user interface turn off many people, but he's just not that interested in appeasing them. "I don't have a shiny game," he says. "It's very difficult for people to get into that. I have the perspective of being a veteran gamer and starting around the mid-'80s, so I don't care about graphics at all. It doesn't mean anything to me. I could play anything. It doesn't matter."